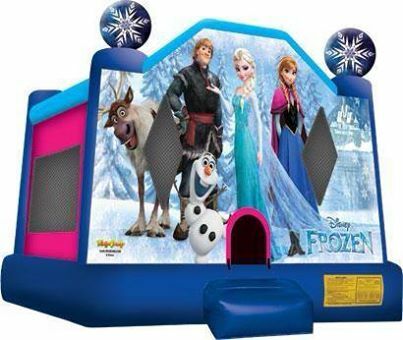 Day and Night Party Rentals in one of the only party rental companies in Western Massachusetts and Northern Connecticut that has the all new Disney Frozen Bounce House rental. Be sure to call in advance because the frozen bounce house rental is in high demand and with only a limited number of frozen bounce houses produced. Your kids will love bouncing and jumping in any of our bounce house rentals. Some other favorites are Princess bounce house rentals, Sponge Bob Bounce House Rentals, Happy Birthday Bounce houses and many more. We are a full service party rental company. We deliver and set up tent rental to the Western mass and Northern Connecticut area. Frozen Bounce House Rental with delivery to: Westfield MA, Springfield MA, West Springfield MA, Agawam MA, Amherst MA, Belchertown MA, Chicopee MA, Holyoke MA, Easthampton MA, East Longmeadow MA, Ludlow MA, Longmeadow MA, Southwick MA, Northampton MA, Suffield CT, Enfield CT, Granby CT, and Windsor CT. If you don't see your town listed call to see if we service your area.